As a girl I remember stories about Ira Hayes. Johnny Cash has a song "Ira Hayes" about the Pima Indian that went to war. Here is the picture and story of Ira Hayes. Old Glory Goes Up On Iwo Jima, Mount Suribachi, Feb. 23, 1945. Ira Hayes is a Pima Indian From Gila River Reservation Arizona. I am Pima Indian from the Salt River Reservation , north of Gila River. 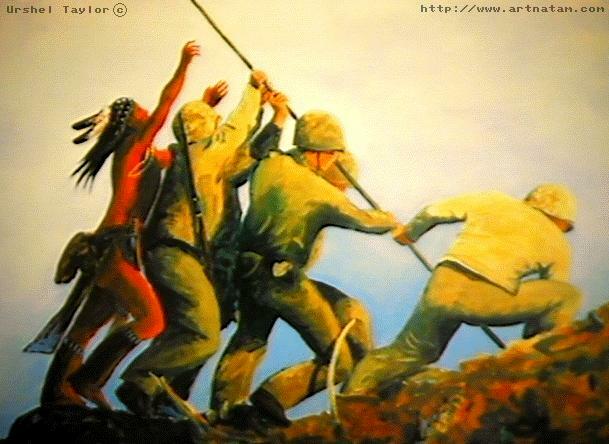 I am also a former Marine that spent many year's over seas but I never went through the battle Ira Hayes went through. Ira Hamilton Hayes is a full blood Pima Indian and was born in Sacaton, Arizona, on the Pima Reservation on Jan 12, 1923. His parents Joe E. and Nancy W. Hayes were both farming people. By the beginning of 1945, he was part of the American invasion force that attacked the Japanese stronghold of Iwo Jima. On Feb. 23, 1945 to signal the end of Japanese control, Hayes and five other's raised the U. S. flag atop Mount Auribuchi on the island of Iwo Jima. Three of the six men were killed while raising the flag. This heroic act was photographed by Joe Rosenthal, and it transformed Ira Hayes' life for ever. Subsequently a commemorative postage stamp was created as well as bronze statue in Washington DC. President Franklin D. Roosevelt called the brave survivors of the flag raising back to the United States to aid a war bond drive. They were shuttled from one city to another for publicity purposes with questionable sincerity on the part of the American military. Ira Hayes asked to be sent back to the front lines, stating that "sometimes I wish that guy had never made that picture". At the conclusion of World War ll he returned to his reservation, disillusioned by what he felt was unwarranted adoration. He began to drink heavily resulting from well-meaning friends offering drink's in their appreciation of his "Heroism". Shipping and Handling $7.50 per Order. American Express Credit Card * Pre-Paid Checks * Money Orders Accepted.